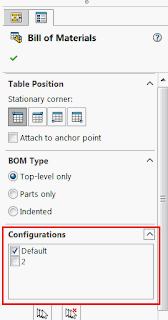 This macro will update the referenced configurations for all Bill of Materials (BOM) tables on the active drawing document using SOLIDWORKS API. Bill of Materials tables are not associated with the drawing views and will exist even in case view is deleted. BOMs are not linked to the referenced configuration of the view. So if the view’s referenced configuration is changed - the BOM won’t update. This macro will find all BOM tables and update their referenced configurations based on the default view of the sheet.